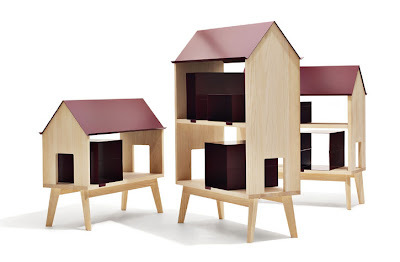 [BB-Blog]: Home Sweet Home storage and room divider. Home Sweet Home storage and room divider. It's a shame these aren't for sale. They'd look amazing between my living and dining rooms. In this year's [Danish Exhibition SE] “FIFTY-FIFTY” (November 22, 2008 – January 4, 2009), Bentzen designed the furniture series “LIBRARY”. 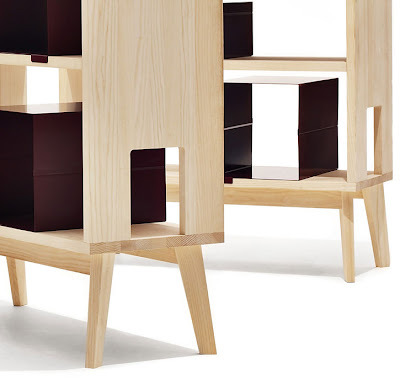 The name of the furniture series is derived from the functionality of the piece, and not by its appearance as the three furniture pieces look like wooden houses with a roof and windows made of steel. The windows are used for storage space of magazines, books and whatever else needs the shelter of a cozy house! Those could be converted into an awesome chicken coop!